Maine is among the top ten states with the highest rates of opioid-related overdose deaths. 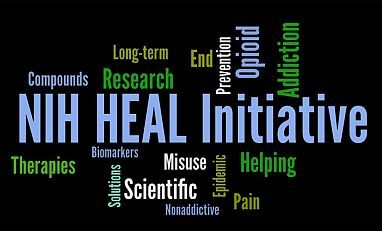 In 2016, there were 301 opioid-related overdose deaths­­­ in Maine—a rate of 25.2 deaths per 100,000 persons and nearly double the national rate of 13.3 deaths per 100,000. Since 2012, the number of deaths attributed to heroin overdose has increased from 12 to 55 in 2016—a more than fourfold increase. 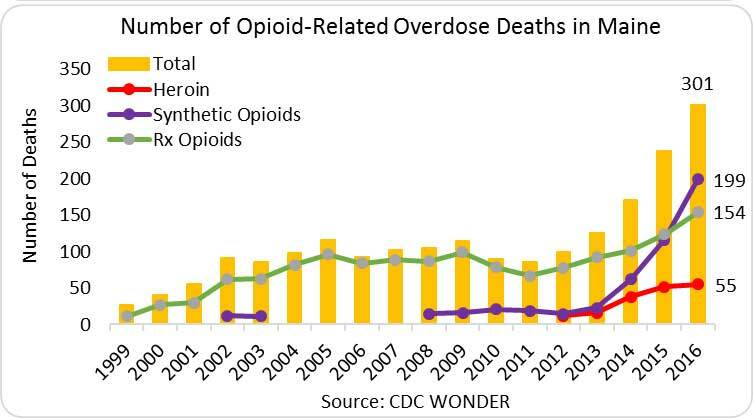 Synthetic opioid-related overdose deaths have increased even more dramatically, from 19 to nearly 200 deaths, in the same period. In 2015, providers in Maine wrote 70 opioid prescriptions per 100 persons (approximately 985,562 prescriptions)—the same as the average national rate (IMS Health, 2016). The incidence of NAS in Maine has increased from 3.0 cases per 1,000 births in 2002 to 30.4 cases per 1,000 in 2013, a more than tenfold increase. The average across 28 states included in the 2013 analysis was 6.0 cases per 1,000 births (CDC, MMWR, 2014). State Incidence: Of the new HIV cases in 2015, 45 occurred in Maine, with 14.3 percent of new cases in males and 11.1 percent of new cases in females attributed to IDU (AIDSVu). State Prevalence: In 2014, an estimated 1,454 persons were living with a diagnosed HIV infection in Maine—a rate of 126 infections per 100,000 persons. Of these, 14.9 percent1 of males and 28.7 percent of females were living with HIV attributed to IDU (AIDSVu). State Incidence: In 2015, Maine reported 1,487 cases of chronic HCV and 30 cases of acute HCV at rates of 111.8 cases per 100,000 persons and 2.3 cases per 100,000 persons, respectively. 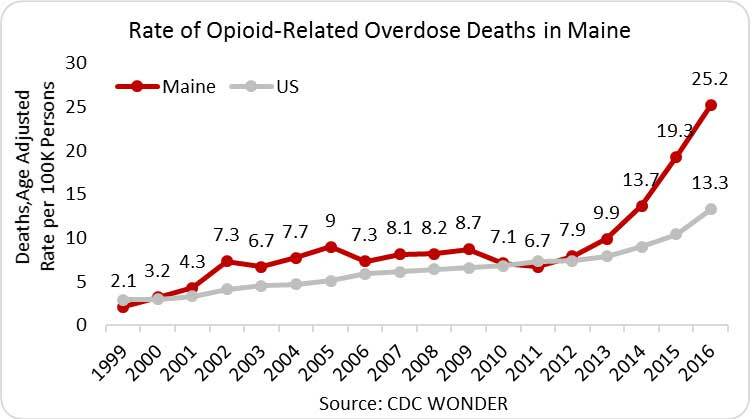 The major risk factor for acute cases in Maine was injection drug use. Twenty cases (67 percent) reported that they injected drugs within 6 months prior to symptom onset (Maine.gov). State Prevalence: In 2013, an estimated 21,000 to 26,000 persons were living with HCV in Maine (Maine.gov).